I really hope this tattoo fad runs its course soon. That aside, I do like the toys! Yes, pumping foreign chemicals of unknown origin in to ones body seems like an especially bad idea. Also , probably an indicator of , a low, IQ. Not just the tats: the painted nails indicate a significant deficiency of some sort. 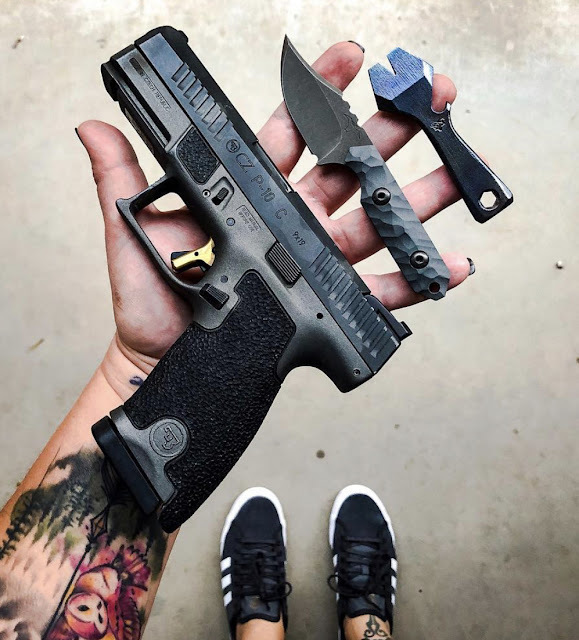 CW, my ignorance is going to show, what is EDC, and what is that scaled down pry bar? Somebodies idea of a joke? Also, In the last EDC you showed a blue C thing and I asked what it was and nobody volunteered. I am not sure about the reason for carrying a little pry bar either. Agree about the tats and also hat the CZ is a nice pistol - low bore axis helps with recoil in all calibers. EDC = Every Day Carry. There's a whole sub culture of people who are into carrying as many pocket sized tools as possible to be ready for anything, so to speak. The blue C thing I don't know, but I'm sure it will do six or seven different jobs. Thank you, my ignorance knows no bounds... as I wasn't able to figure what EDC means, duh. Go back and read the post, Cederq. Blue C thing is a rope tightener.